If you're great at what you do, but not so great at getting new clients, check out this post to learn how to boost brand visibility, generate more leads, and land more clients for your freelance business. The biggest challenge most freelancers face isn’t doing the work — you started freelancing because you’re great at what you and you enjoy the work. The work is not the issues. The challenge also isn’t managing the actual business side of things, even though that can be tough. The truth is that the biggest challenge for most freelancers is generating leads and finding new qualified clients. In fact, many freelancers I know, including myself, struggled big time to fill their pipeline with prospects who value what they do, are ready to get started, and happy to pay the full rate. This is especially true during the first few years of running a freelance business. Luckily there is no one way to generate leads and land new business. Client success stories or case studies give prospects the opportunity to see how you helped a specific client achieve their objectives. While testimonials tell a top-level story of the experience, case studies tell the bigger behind-the-scenes story of the project and because they tell the story from start to finish, they are one of the few marketing tools that can be used during every stage of the customer journey. Case studies help prospects learn about your services, the client experience, and how your offering fit their business needs. They also help the prospect relate to a past client’s story, identify themselves as a client, and see what’s possible. Whether it’s a forum, a membership community, or a Facebook group, find out where your ideal clients are spending their time online, go there, and be as helpful as possible. Watch for any questions related to your area of expertise and answer them to the best of your ability. Answering questions in online communities is a lot like dating. Don’t jump in with pushy sales messages to try and land a new client right away (or at all). Instead, focus on being helpful and being visible, and soon people will begin seeing you as the expert on that topic, they’ll tag you in their posts with a question, and you’ll be seen as a go-to resource and trusted service provider. While blogging these days is more about quality content that quantity of content, it is still critical that you publish new content to your blog on a regular basis. Blogging regularly demonstrates your credibility and reliability to your audience and it helps your site stay relevant in search results. A content upgrade is an extra content people can get in exchange for their email address. It’s similar to a traditional opt-in offer, but unlike site-wide opt-ins, content upgrades are directly related to the content people are already reading, watching, or listening to. Content upgrades are highly effective because they are presented in context, like in a blog post, in a podcast, or in an audio recording and they offer more content about that exact same topic. Want to leverage systems to free up time, automate tasks, and grow your business? Download my Creating Systems Workbook to get started. In addition to blogging on your own website, being contributing guest blog posts to other websites that serve the same audience you do. Guest blogging allows you to gain exposure, visibility, and access to a whole new audience for your name, brand, and expertise. Just remember that a single guest blog post isn’t going to move the needle much. When pursuing guest blogging, try to negotiate a bundle of 3-5 articles over time. I guest blog for Liquid Web and GoDaddy and it’s great exposure for my courses and agency. One of the fastest ways to expand your network, make valuable connections, and dramatically increase your visibility is to start a podcast and interview other experts, influencers, authorities, service providers, and product owners who serve the same market you do. When you have an audience in common, the Podcast becomes a win-win-win: A win for you because you gain access to someone else’s audience, a win for the guest because they gain exposure through your podcast, and a win from the audience because they learned something new. Don’t have time to start your own podcast? No problem! First, invest in researching which podcasts target the same audience or client segment that you do. Second, learn everything you can about those podcasts to identify those that would be the most mutually beneficial. Third, put together a pitch for each podcast host, sharing why you’d like to be a guest, why you’re a good fit, what you can bring to the table and deliver to the audience, and why this is a good fit for the audience. If you put in the work and have a great pitch, you’ll win guest spots on podcasts that can help expand your brand visibility. Position yourself as an authority figure, industry expert, and thought leader by speaking and sharing your knowledge with others. Get started with speaking at local networking groups and through organizations like Toastmasters, then expand to regional events, and national events. When speaking at an event, if there is flexibility in the schedule, ask the organizers if you can deliver your talk on the first day or first thing in the morning. This way you’ll be present and available the rest of the event or day to answer attendee questions and chat up the crowd. This can be especially lucrative from a lead generation standpoint if the audience is made up of your ideal clients. Networking groups like eWomen Network, National Association of Women Business Owners, American Marketing Association, Public Relations Society Of America, American Advertising Federation, and local groups found through Meetup.com can be goldmines packed with new clients if you select the right networking group. The key is to focus on the groups your ideal clients attend and not the ones focused on your industry that are full of other people who do the same thing you do. While industry networking groups are valuable, if you need clients, you need to go to where your clients are. Unlike traditional networking groups, leads groups are all about passing active leads to other members of the group and at each meeting, the focus is on who you have leads for, giving referrals, and building relationships. The idea is that if everyone comes ready to give, everyone will in turn benefit. Attending local networking events is a great first step toward the expansion of your brand visibility, but at a local networking event, there may only be a few people at the entire event who are a fit for your services and investment level. At large national or international conferences, however, you’ll find entire ballrooms full of people who fit your ideal client description. For example, if you build websites for authors and speakers, you should be attending the Association of Writers and Writing Programs Conference, the Writer’s Digest Annual Conference, the San Francisco Writers Conference, and BookExpo to name a few. While it costs more to attend conferences like these, usually just one new client can cover your costs. Once you have attended a few conferences and experienced first-hand how the business expos, trade shows, and sponsorships work, you may want to sponsor an event or two to gain increased brand exposure. Ideally, you want to look for sponsorship options that give you an opportunity to speak, be highlighted in front of the room, or be showcased individually. Executives, business owners, and high-ranking employees are usually involved in some type of volunteerism outside of business. On their own, or on behalf of their company, they sit the Boards of Directors, chair committees, and get involved in fundraisers for social causes they believe in. One of the easiest ways to give back to your community and expand your network with high-level influencers and well-connected professionals is to get involved in volunteerism through local non-profits and social causes. By getting involved, you’re not only helping your community, but establishing common ground, building relationships, and getting to know others involved on a personal level. This is a long-term strategy that can produce amazing results. Leverage your email signature in direct communications to include a call to action or promotion for a new service offering, a new lead magnet, a special event, or special sale. All major holidays are a perfect excuse to reach out to your existing clients, past clients, subscribers, and leads with a genuine holiday related message and an update on what’s going on with your company. It’s the perfect time to also share information about new services you offer. There are also made up holidays occurring almost every day of the year, like National Pickle Day and National Pretzel Day. Find a few fun holidays that align with your business or marketing and leverage them for some fun promotions that keep you top of mind. More links mean more traffic. More traffic means more conversions. More conversions mean more clients. If you want more clients, you need to invest in an ongoing link building strategy. Link are the roads of the internet, the way that search bots and humans move from one web page to another and one website to another and the more quality links you have pointing back to your website, the easier it will be for people to travel to your site and interact with your content. While many freelancers focus on free marketing options like organic SEO, blogging, and social media, paid advertising is still a smart marketing strategy when done right. Pay-Per-Click advertising and remarketing (serving targeted ads to those who have previously visited your website) gives you the ability to stay top of mind as those who have visited your website continue to search and browse online. Unlike pay-per-click ads, where you pay for every click of an ad you get, social media ads (like Facebook ads) are billed the space you buy. The number of impressions or clicks on a social media ad doesn’t change the cost. Advertising through social media platforms like Facebook are rising dramatically in popularity because of the data available and your ability as an advertiser to target very specific parameters with your ads. Advertising through social media channels works well to boost brand visibility and recognition and lead viewers to the next logical step, opting-in to a free offer, registering for a webinar, liking a page, or taking advantage of a sale. With 1.57 billion total monthly active users, 30+ million daily active users, 50 million people creating content on the platform, 5+ billion videos shared to date, an average viewing session of 40 minutes, up 50% year-over-year, and 300 hours of video uploaded every minute, YouTube (source) is technically the second largest search engine in the world. Needless to say, YouTube isn’t a platform to be ignored. If you’re not yet creating video content for YouTube, make this the year you get started. Whether you meet someone at a networking event, conference, industry meeting, casual dinner, or even a party at a friend’s house, if you end up talking about the work you do, make sure to follow up. For a casual conversation, your follow could be a quick note saying that it was great to connect. Other ways to follow up include handwritten notecards, personal emails, connection through social media, phone calls, and even email automation. With a strong focus on following up with connections and following up on conversations, you’ll build stronger relationships, build greater credibility and trust, and earn more business. Email marketing remains to this day one of the most effective forms of marketing, yet many freelancers fail to turn their subscribers into clients and customers because of one major mistake: They fail to ask for business. In every email newsletter or email update you send, make sure to include at least one call to action to take the next step and book an appointment, buy, or hire you. It’s also a good idea to include secondary calls to action or links that can help further segment your list for more targeted marketing in the future. Great testimonials build trust and credibility, overcome skepticism, and persuade prospects to take action with emotion. Testimonials that tell a story — where the client was before working with you, what you did together, and where they are now — not only set you apart from the competition but make investing with you feel less risky and more critical to their success. You can see samples of great testimonials on the sales page for Profitable Project Plan and on my agency site. Not all business partnerships are created equal and some will produce much more lucrative results than others. The most successful strategic partnerships are those made between two freelancers or two businesses that provide complementary, non-competing services and whose target markets align. This way you can leverage co-branding and co-marketing to build both email lists and fill both pipelines at the same time by gaining exposure to each others’ audiences. Referrals are the lifeblood of a professional services company, especially for freelancers. If a someone sends a referral your way, you absolutely must over Deliver on the referral. First, over deliver for the person who made the referral, let them know you spoke to the referral and whether it was a good fit, let them know when you send a proposal or estimate, and let them know if the prospect signs a contract. Each time, thank them for the referral and upon contract signing, send them a gift. Second, over deliver for the person who hired you based on the referral. They are going to stay in touch with the person who referred them and they’re going to share how your work together is going. Make sure both parties are thrilled with the referral by providing extraordinary service every step of the way. Many people will tell you to reach out to your contacts, clients, and peers and ask for referrals. While this strategy can work, it’s is much more effective to take it one step further and ask for introductions. Asking for an introduction means instead of awkwardly reaching out to a referral or waiting for someone else to contact you, you’re guaranteed a connection with a “yes” answer and that personal introduction will start the ball rolling. A warm letter is like the letters you receive in holiday cards that give you an update on what’s been going on over the past year and what’s new. Your client-attracting warm letter gives your contacts an update about what’s going on in your business, who your ideal clients are, and what if any new services you’re offering. Keep your warm letter sales-free, but be sure to end the warm letter with a call to action. Ask if they know someone who may be a good fit or if they want to schedule a discovery session to learn more. The biggest challenge of any cold email is getting the entire email read and that means the goal of the first sentence is to get the second sentence read, and the goal of the second sentence is to get the third sentence read, and this process continues to the end of the email and the closing call to action. Social media is a simple way to remain visible and stay top of mind with your target market. Authentically connecting with others, engaging in meaningful conversation, and publishing tips, quotes, links, and helpful content regularly will position you as an expert and go-to resource. Bonus Tip: Use hashtags to make your content easy to find by those interested in the specific areas you offer services in. Not every person who visits your website is ready to hire you or buy from you right away. For most people, they first need to get to know, decide they like you, and gain trust in you before they’re ready to make a purchase. A lead magnet meets visitors where they are with a specific solution to a challenge they currently have in exchange for their email address. It exists to convert visitors into subscribers and leads that are now in your sales funnel. Video Trainings: Video trainings help people get to know you and your teaching style, it gives them a sample of your expertise, and a taste of what it may be like working with you or learning from you in the future. eBooks: Dive deep on one specific topic and provide incredible value. Surveys: Surveys work great as short term lead magnets Invite your audience to participate in the survey with the promise to share the results with them in a special report. Quick Tools: Provide a quick tool of value like a checklist, tips sheet, list of mistakes, inside secrets, scripts, or even an FAQ. Worksheets And Workbooks: Help your audience move the needle and actually get something done with a worksheet or workbook that guides them through simple exercises and the accomplishment of a goal. Quizzes: If you want to segment your leads, consider using a quiz to help your audience learn something about themselves or find out what segment they belong to, then deliver specific solutions for them. Audio Downloads: Creating high-quality audio is much easier than creating videos and people love to download audios to their phone to listen to in the car, lounging by the pool, during a walk, or at the gym. Printables: Create forms, worksheets, tracking sheets, reminders, daily planners, business tools, manifestos, and other downloadable resources that inspire action and help your audience get things done. Webinars: Teach your audience something with highly-focused webinars that focus on the “How-To” and at the end include a call to action for the next logical step. First Book Chapter: If you’re an author, give away the first chapter of your book to capture leads and grow your email list and follow it up with a special sales offer. First Course Module: If you have an online course or program, attract new leads by giving away the first module for free to build your list. This gives them a sample of what’s to come in the rest of the course and provides you an opportunity to make an irresistible sales offer to those on your list. Swipe Files: Provide a collection of emails, scripts, marketing materials, Facebook ads, and social media posts your audience can copy, paste, and customize for their business. Print is not dead! Print marketing materials still work! From brochures and rack cards to postcards, bookmarks, and stickers, print materials put your brand in your audience’s hands. Plus, print materials can be mailed, handed out, and even left at partner businesses to gain visibility in their offices, shops, and storefronts. And, unlike website URLs that get bookmarked and forgotten, print materials get stuck on refrigerators and cork boards, saved on your prospect’s desk, and even given to friends and family. Give prospective clients who are on the fence a sample of what it will be like working with you by offering a free consultation. Give them the chance for a mini session with you to get help on something small, pick your brain, or get some advice. This gives you an opportunity to show them how amazing you are and share some opportunities to take the next step. Way too many business owners leave money on the table and lose business because they simply fail to follow up after a prospect says no… but no isn’t always the end of the road. When a prospect says no and chooses not to hire you, follow up with them and ask why? Find out what reason they had for passing on the project. In many cases, the reason will be something small that you easily overcome or negotiate and you’ll end up winning the business after all. Never underestimate the power of connecting with your tribe in person. Consider offering a live workshop where members of your community can come together, network, and learn from you in a group setting. This is another way to give them a sample of what it’s like working with you and motivate them to hire you for one-on-one services. Create a three to seven-day challenge to help your audience achieve one focused goal and make that goal something they truly desire and dream of. Be sure to have an upsell ready at the end of the challenge to help participants that the next step. Clarity.fm is a platform that allows you sign up for an account, create a profile, and begin offering pay-by-the-minute advice or consulting and Clarity does all the work to collect the money for you and ask for testimonials. It’s not only a great way to offer paid consulting without the requirement of a big commitment or contract but a way for prospects to sample what it’s like to work with you. If hosting an in-person event isn’t in your budget, consider hosting a virtual conference or summit. Gather together a group of respected experts on a focused topic and invite each one to deliver a webinar style presentation as part of the virtual event. This is a great way for everyone involved to gain more visibility for their brands and reach new audiences. Just be sure that you’re always putting your audience first. This means selecting the best speakers for the event who have the most to offer your audience, not the ones with the biggest lists you can piggyback on. Most business owners work hard to publish content regularly to their blog, which is awesome, but they don’t do much else other than share the links to their posts on social media. You can get a much bigger bang for your buck or return on your effort by syndicating your blog content across several media platforms. Publish the original post to your blog and market it like crazy. A few weeks later, publish the same post on Medium and link back to the original article. Then publish the same article on LinkedIn and link back to the original article. Checking the mail can be sort of depressing. Most of the time it’s just a collection of bills and junk. But every once in a while, something special comes, it grabs your attention, and you save it. Direct mail campaigns work, but you’ve got to get creative. Skip the in-your-face, overly salesy postcards and go for a more custom approach like using a colorful envelope, making your marketing piece a unique size, putting it in a box, or handwriting your message. Also, note that I said direct mail campaign. Just like as attending networking event one time isn’t going to land you a flood of clients, sending one piece of direct mail isn’t going to do much. You’ve got to send several pieces over time. Don’t have a ton of time for marketing but want to get your name out there in a big way? Hire a public relations professional to develop talking points for you, help create a media page for your website, provide media training, and do the footwork to get you bookings on radio, television, and podcasts, and mentions in print media, on websites, and across social media. Starting a meetup group doesn’t cost much and with Meetup’s community and reach, you can quickly get your group in front of fresh faces and potential clients. As your group grows, your network grows and your pool of potential prospects grows. Just make sure that your meetup provides immense value so people want to keep coming back. A meet up that’s all about you selling yourself isn’t going to attract anyone. Be careful with contests! The allure of a general contest that adds thousands of people to your list is great, but the downside is a bloated list of non-ideal leads. If you offer a contest, keep it as specific as possible, keep the prize on brand, and make sure it of value to your ideal clients. No one can hire you, buy from you, or join your list to learn from you if they don’t know you exist. Search engine optimization (SEO), the process of increasing traffic to a website by making sure the site appears high search engine results pages, helps new people who are looking for the content you have created and the services you offer discover your website. Finding a balance between serving your existing clients and finding new clients can challenging, but with documented systems, you can delegate and automate many associated tasks. Just remember to make lead generation an ongoing priority even when you’re booked solid. The times when you are booked solid are actually the most important times to focus on lead generation because the process of converting a contact into a lead and a lead into a client take time. If you get lazy about lead generation during your busy times and wait until you’re slow, you’ll find yourself on the freelance feast or famine roller coaster and that’s never fun! 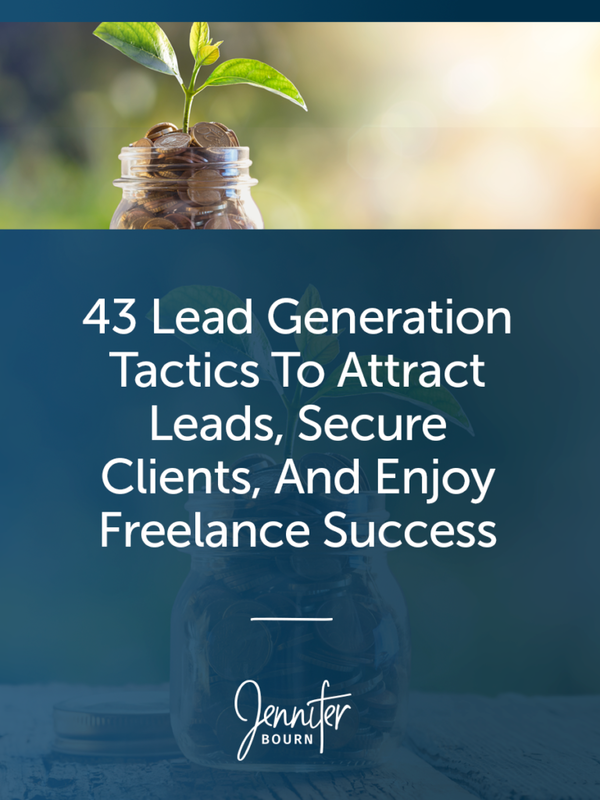 Luckily, generating leads for your freelance business just got easier because you now have this list of 43 lead generation tactics to choose from. So pick a few, get started, and start attracting more leads, securing more clients, and enjoying more freelance success.